I was located in Bangkok again and this time, it was a different weekend for me as I have had my friends who brought me out of Bangkok city area into the Northern part which was approximately 2 hours’ drive with resting intervals in between. 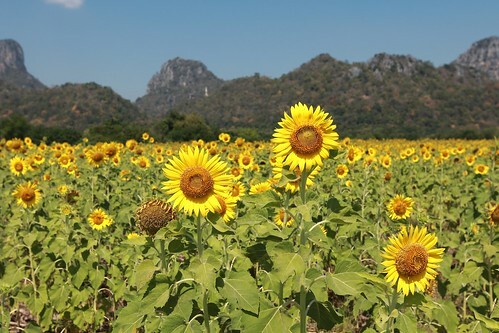 For a foreigner like me, I don’t think I will have the chance to visit the sunflower field even if I visit Thailand for millions of times as tourist without engaging any locals’ help. I must thank my friend and my other new-found friends who are also avid photographers for letting me to have a chance to enjoy Thailand like a local, literally. It was definitely a great experience that I would love to have! The journey is what I would have expected, a long way on the road towards our destinations and upon nearing the fields, we were already greeted by beautiful sights of sunflowers that cannot be missed as their color truly stands out of the greens. It has been a long time since I last stepped out under the scorching hot sun without any form of protection on my skin, so it became a little intolerable for me to stay under sun for longer than 2 hours. The fields were filled with local visitors but not crowded as I like. I have always heard people telling me that sunflowers can put a smile on one’s face. I kind of agree with that as the sunflowers have indeed brought laughter and fun to the visitors there. This post will end the year 2012, indeed, this has been a quick but fulfilling year when I have started moving towards sharing more of my photography works here in my blog. I am definitely looking forward to the year 2013 with greater photography opportunities! Cheers! Beautiful to see on a winter morning! A beautiful field of sunflowers, I love the photo with the mountains in the background, looks awesome. Exactly! I loved this place for its gorgeous landscape, definitely a breathtaking and relaxing one. Such happy flowers! Just gorgeous. Happy 2013 to you! AWESOME!!! I always smile when I see sunflowers. any idea how to get there from bbk ? Haa! Good question! I have no idea. It might be a good idea if you can get a private driver to drive you there! Love sunflowers! Had four pop up in my garden (Nov 20 post) and got to enjoy up close. Will be planting more of these happy flowers in the future. Happy New Year, Alex! Lovely photo. Happy new year to you too and have a blasting year! Thanks for dropping by! Stunning!!! I love sunflowers and it was awesome you got to go to Thailand! Thanks!! It was indeed an great experience for me and a fabulous opportunity to be in Thailand! Hey Christine! Thanks so much! Yes! I must say I am fortunate to visit the field of sunflowers! Hope you have a great year ahead too! Thank you for visiting and the like of my post “Dissolving Cloud Trails”. Thank you! I’m glad that you complimented on my pictures! 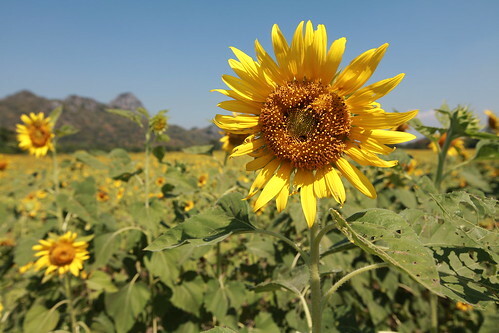 I didn’t know they had sunflowers like this near Bangkok! Great photos! Out of curiosity what type of camera and lens were you using? I was using 5D mark II with 16-35mm f2.8 II L. Thanks for your compliments! Love your photos Alex! Is there another post in the works? I guess not. Thank you so much for your compliments! Thank you for dropping by and your compliment! Cheers! Agreed! I prefer summer than others though. No problem. They are well deserved! Thanks! Very nice of you to drop by! 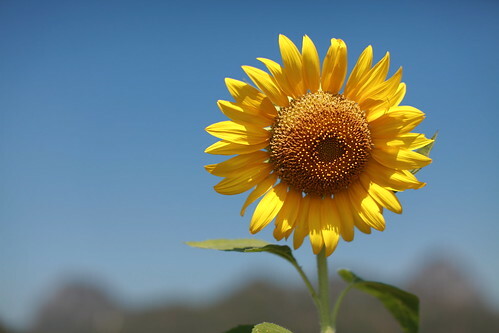 nice pix Alex….first one is like its not of Sunflower but of Sun itself so bright and shiny….. Thank you for your compliment! It’s really nice to have you here in my post! Cheers! Currently it is snowing out and very cold here, so looking at those great images of sunflowers has warmed me up! Appreciated your compliments here as well!!! Thanks!! Those are great shots Alex! Your exposure setting was spot on! Thank you so much for your encouraging comment! It means a lot to me! Thanks! Needless to say i love your ‘blog layout’! 😮 Very similar tastes!!! And, about your post, who doesn’t love sunflowers? :p Take care! Thanks for liking my blog! Do feel free to follow too! Thank you for your compliment!! Cheers! Love the beautiful sunflowers, Alex! The blue and yellow together are beautiful! I have always wanted to take photos in a sunflower field, but have yet to find one. Yes! The color contrast here is really nice and I love it a lot! Thanks for your compliments! You have to! Make sure you have a local guide to bring you around! Love the first one – beautifully exposed and looks great against the blue sky. Thank you! A beautiful place indeed!